Dwarka means ‘door to salvation’. It was in the state of Gujarat. In fact, Lord Krishna and his brother Balrama established the city. Legends have it that after the death of the Lord, the city got submerged in the sea. The Dwarkadheesh temple in Dwarka is very popular for its huge and grand Janmashtami celebration. Devotees from all the country visit the place during the month of Shravana to celebrate the anniversary of Lord Krishna. The Aboti Brahmins of the city is known to perform the daily routine of the Janmashtami pooja. It is known as ‘nitya kram’ of the Lord. The celebration of Janmashtami in the main Dwarkadhish temple is very famous in India. Devotees from all over India throng the city of Dwarka during Janamashtami. 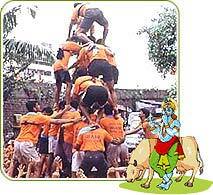 The celebration on Janmashtami follows the daily routine or ‘Nitya Kram’ of Lord Krishna. Rituals are performed by Aboti brahmins, who are special brahmins performing these rituals for the past many centuries now. Lord Dwarkadhish is adorned with lot of Gold jewellery and other precious stones such as Diamonds and Topaz. This happens around 11:00 pm. Utsav Bhog is offered to Lord around 11:30 pm. Devotees are not allowed to see the process of Utsav Bhog though they wait eagerly for their beloved Lord in the temple premises and sing bhajans. The devotees welcome the Lord at 12 midnight with immense enthusiasm and joy. After nearly two hour celebrations, the temple closes at 2:00 am after the mahabhog offerings to Lord Krishna. Bal Gopal idolis kept in a cradle in the temple premises for the darshan of the general public. Thus the janmashtami celebrations finally come to an end in Dwarkadhish temple.